In need of a more durable option for protecting your clothing from water, splashback, or messy cooking processes? 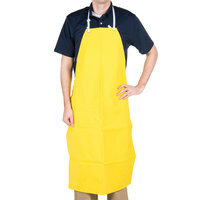 Our supply of rubber aprons and vinyl dishwashing aprons will do the trick when regular cotton and polyester options just won't do! A rubber apron can come in handy not only for dishwasing processes, but for a variety of messy cooking processes as well. Try using our neoprene apron when butchering or cooking and handling large pieces of barbecue to protect your clothing from unwanted stains. 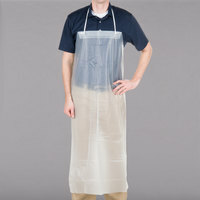 Our vinyl aprons are perfect for keeping clothes dry during manual dishwashing processes, or can come in handy during other wet cleaning processes. No matter what you intend to use it for, a rubber apron will provide extra durability and added protection over cloth aprons.